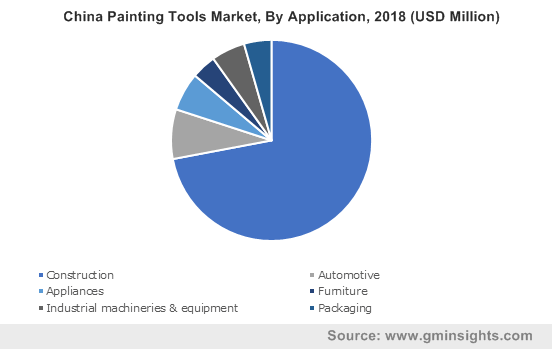 Global Painting Tools Market size was valued at over USD 10 billion in 2018 and is anticipated to witness a CAGR over 6% up to 2025. 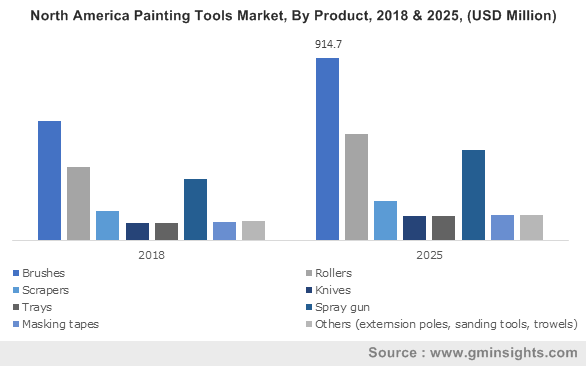 Increasing demand for the modern painting tools owing to its low cost, easy availability, and consumer-friendly features as compared to the conventional tools will create new avenues for the painting tools market growth. Key properties such as ease in paint application on walls & ceilings, improved aesthetic appeal of walls and less wastage of paints will enhance the industry landscape. Besides, growing population along with increasing purchase power parity is promulgating the consumer goods and automotive demand, that has led to robust industrialization. Thus, in return is proliferating the overall business expansion. Increasing applications from decorative paints and industrial protective paints is expected to fuel the painting tools market demand. The products with decorative design are expected to witness high demand, hence increasing product penetration. Moreover, shifting preferences towards wood coating and furniture coating will further augment the product scope in the industry. In addition, rising income levels and shifting consumer focus towards eco-friendly products among developing economies such as India, South Korea, and South Africa will boost the product penetration in the market. Increasing demand from interior and exterior applications will drive the industry growth. Rising nuclear family has resulted in higher housing requirement, which is driving the overall industry growth. Shifting consumer preference towards small family coupled with increasing population will boost the overall industry demand. In addition to this, properties of painting tools such as ease of applications and affordability will drive the product penetration. 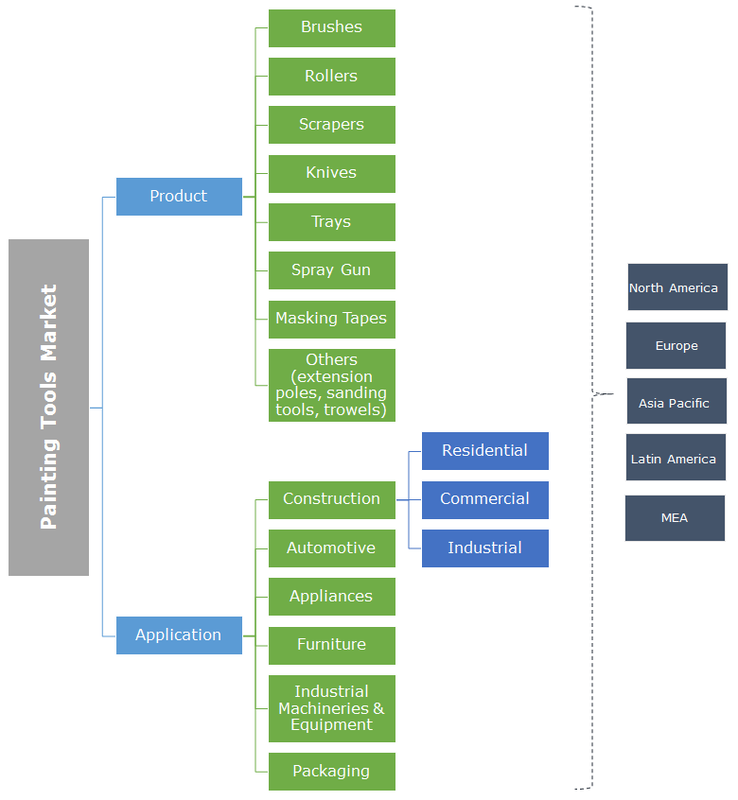 Global painting tools market is projected to grow with the increasing demand for residential buildings. Overall construction industry is expected to show significant growth during forecast period. Growing consumer preferences towards affordable housing and measures taken by the government to provide housing and commercial amenities at subsidized rates are expected to boost the overall industry growth. Furthermore, rising demand for residential and commercial appliances will further augment the product portfolio. Stringent government regulations & norms pertaining to the limited usage of VOCs in certain paints & varnishes will provide strong outlook for the market growth. Low awareness along with the expensive products including spray gun & sanding tools may hamper the overall painting tools market size. Global painting tools market from brushes are projected to surpass USD 3.7 billion up to 2025. Major benefits including less paint usage, easy handling, better coverage of the surface area, and convenient blending of several colors will provide positive scope for the product portfolio. In addition, key properties such as high elasticity of the bristles, large number of split ends, thicker base, and thinner at the ends will further augment the market share. Rollers are anticipated to witness a growth of over 6% in terms of revenue in the overall painting tools market up to 2025. Shifting consumer trends towards coated furniture & wood to enhance product life will fuel the industry growth. Standard painting in lesser time coupled with minimal wastage of the paint are among the major properties driving product demand in the market. In addition, key benefits including less paint applications, improved quality of finish, and carrying out complex painting will drive the overall business expansion. Global painting tools market from construction application is anticipated to surpass 1 billion units by 2025. The incorporation of green technology in several construction projects due to the high sustainability & longevity of the building structures will drive the market size. Key benefits of the paints & coatings including increased resistance of the various surfaces and prevention of the surface from weathering and rusting will provide positive application scope in the industry. In addition, rapid expansion of the residential and commercial buildings across developing countries such as UAE and Saudi Arabia will further propel the application scope. Automotive application will observe significant growth exceeding 5% in the overall painting tools market over the forecast timeframe. Growing automotive industry has resulted in high demands for paints & coatings for providing protection and aesthetic appeal to the vehicles. This has driven the business share in the automotive driven economies. In addition, favorable climatic conditions coupled with easy employment are the key factors for increasing automobile industry which in return is further propelling the overall market size. Asia Pacific accounted for over 40% revenue share in the overall painting tools market in 2018. An upsurge in the commercial & residential building projects across several developing economies such as UAE, Saudi Arabia, and South Africa will enhance the business expansion. Rapid urbanization & infrastructural development in the major countries across the globe including China, India, and South Korea will proliferate the overall industry landscape across the region. 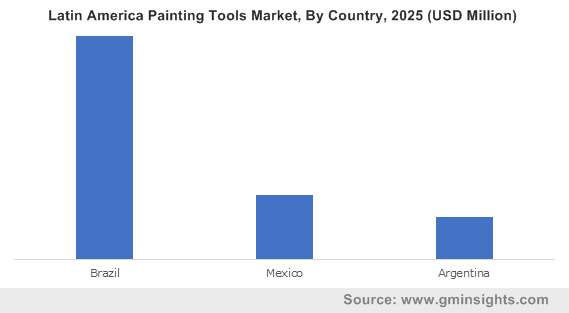 Latin America will witness significant gains at over 6% in the overall painting tools market up to 2025. Several government bodies in the region have started funding the plans for development with the PPP model which in turn will provide strong outlook for the business expansion. Growing demand from the decorations, general industrial, and architectural applications will boost the industry share in the region. In addition, rapid production of automobiles per year owing to the rising income and buying capacities of the consumers will further propel the market size across Latin America. The market share is highly competitive in nature owing to the dominating players such as Asian Paints, Gordon Brush, Dura Paints, and Nespoli Group. The other notable industry participants include Mill-Rose Company, Braun Brush, Purdy, Anderson Products, Milton Brushware, and Richard Tools. Supply chain agreements, product enhancements, mergers & acquisitions are among the key strategies adopted by major industry players. Key manufacturers are involved in numerous supply agreements with the various end-user industries coupled with the major acquisitions & mergers. For instance, on 17th December 2017, Asian Paints acquired Reno Chemicals Pharmaceuticals and Cosmetics Pvt. Ltd for USD 24.7 million. The acquisition helped the company to strengthen and diversify its business and product portfolio on a global scale. The industry consists of several devices which facilitates the coating and paints sector for their application. Numerous equipments & tools category includes rollers, brushes, spray gun, extension poles, and masking tape. Diversified and various application of the elements includes coating vehicles, construction, industrial machineries, and appliances. The usage of metals has escalated extensively owing to industrial revolution during the last decade. Several equipment & machines are protected from rusting and corrosion in the industries with applications of coatings and paints. Increasing demand of paints & coatings is projected to promulgate the overall industry the forecast period.